My Creative Existence: A blog award! Hi everyone! You'll have to excuse the lack of posts lately - I'm just about to move house so things have been very hectic! I'm going to schedule some posts over the next week as I will be off line for a while whilst I get my internet sorted out at my new house. I am very honoured to have been given the "Your Blog is Fabulous" award by not 1 but 2 different ladies! A huge thanks to Renee Ludlow and Shirley Fyfe. 1. Chips and dips - seriously can't go past a corn chip and some home made French Onion dip. 4. Scrapbooking! I'm such a product junkie. 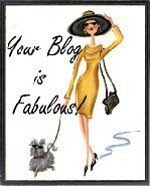 As for 5 other fabulous blogs - well, there are soooo many! I have some blogs in the sidebar of my blog, and anyone of them would deserve this award, so make sure you pop over to their blogs and take a look. But my absolute favourite blog at the moment is Cake Wrecks. Seriously hilarious - I nearly stopped breathing the other day because I was laughing so hard! LOL! You should also check out my friend Jill Geraghty-Groves' blog - she's been doing some mixed media artworks of late that are just sensational!